- Speeds up and ensures a full recovery after the contests. - During the breeding favourable to the growth of the chicks. 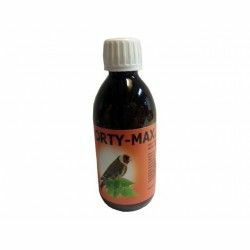 - During the moult is a good supply of amino acids and vitamins to the body. - Administer 20 ml per liter of water for 3-5 days a week. Description: Avipharm of Röhnfried combines electrolytes with glucose and a concentrate of vitamins, especially designed for pigeon competition. 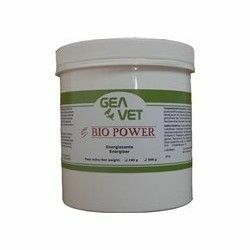 PROSOL avian restorative high potency prebiotic and electrolytes, restorative, formulated as a nutritional supplement liquid for rapid absorption and maximum effect. SINGULAR POINTS Very quick return to the condition of peak after an illness or medications. Helps prevent "bad bug" build. VEGA complex is the most complete and balanced of vitamins in the market. 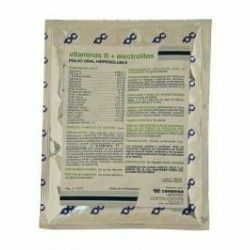 VITAMINS TT + ELECTROLYTES oral powder soluble in water is ideal to treat the lack of vitamins and periods of convalescence in birds (canaries, parakeets, finches, chickens, partridges, etç....). Its composition is high in vitamins, amino acids and minerals. Oroharma Hemolyt 40 250 g animal Protein, and Electrolytes. To Pigeons. 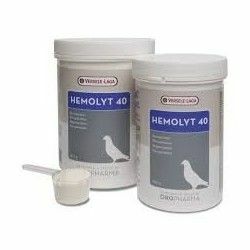 Hemolyt 40 is a mixture of high quality that combines electrolytes and animal proteins. It is the substitute of Fortalyt.